Further evidence of this is in their new video which not only doesn’t provide the key “select color-draw-select different color-draw” demonstration repeatedly requested by backers, it also includes some bizarre attempts at movie-magic using camera cuts that would offend even GOB Bluth. Other changes include the addition of some kind of “tip cleaner” which was added as a $25 option with no further explanation. So like…do I need that? or what? The body of their new campaign is copied word for word from their original Kickstarter launch, so no mention of this change is made. This whole ordeal has been a fascinating and bizarre sequence of events. This team has now produced two completely distinct videos neither of which demonstrate product functionality. The only logical explanation for this is that they do not have a working prototype and are desperately trying to hide that fact. 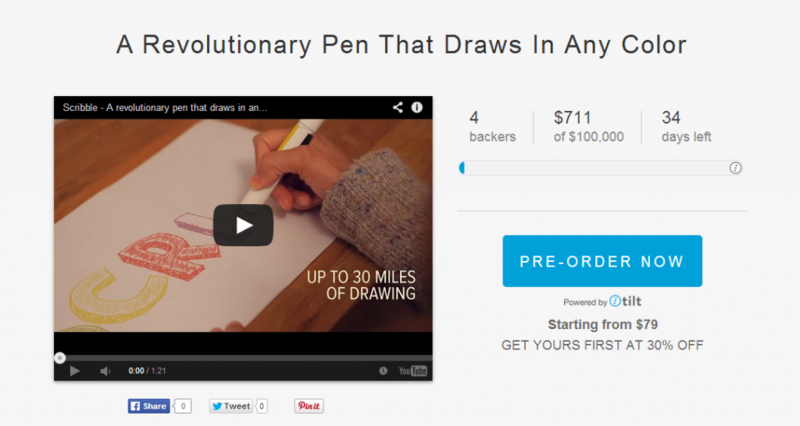 The relaunched project currently has 25 backers after just a few hours. It’ll be interesting to see if they reach the levels it did the first time around. This entry was posted on Friday, August 29th, 2014 at 4:36 pm by ch00f	and is filed under Crowdtilt Campaigns, Kickstarter Campaigns. You can follow any comments to this entry through the RSS 2.0 feed. You can leave a comment, or trackback. Some update, das I got another newsletter. They surpassed their goal of 100,000.00 $. By now the crowdfunder stands by some 120,000.00 $ with some 700 backers. The people still believe in the project, it seems. And I hope that theiy won’t get disappointed . I for myself just wait till the pen is really on the market and we have some actual product reviews on our hands.